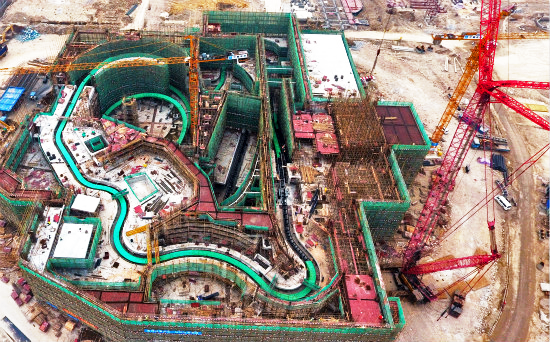 Mega real estate developer Wanda Group has released, through its website and social media, amazing behind-the-scenes images of the highly secretive “multi-dimensional cinema robotic roller coaster” project. In a statement released by the company, the attraction is an 800 million yuan investment within the new Guangzhou Wanda Cultural Tourism City theme park, designed to be a world-class amusement and leisure destination located in the southern Chinese metropolis of Guangzhou. Encompassing over 20,000 square meters, Wanda states the attraction is the first-of-its-kind in the world. An unprecedented marvel of engineering, the ride combines robotic arm movements with roller coaster track elements in a highly-themed cinematic environment. Called the “World’s Most Advanced Multi-Dimensional Cinema”, the dark ride roller coaster features technology from some of the most revered suppliers in the themed entertainment industry. Wanda Group has announced that the sophisticated, technically complex ride equipment is supplied by USA-based Premier Rides who has integrated the robotic technology. This equipment, combined with USA-based Tippett Studio’s full media production and the storyline of USA-based ITEC Entertainment, will achieve the most immersive experience ever built. 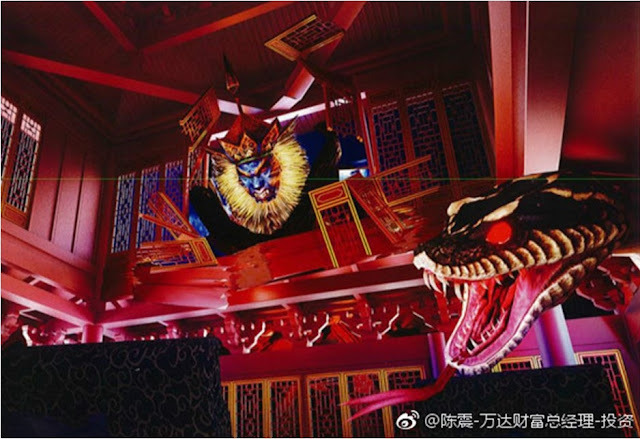 The Guangzhou Wanda Movie Park ride “The Ghouls” has recently completed installation, marking a new phase to the construction of the multi-dimensional cinema project. 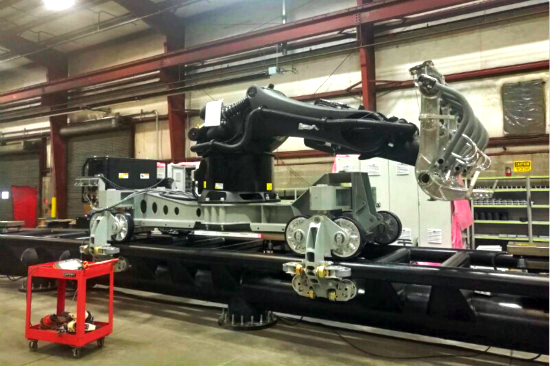 The behind-the-scenes images of the factory testing reveal the state-of-the-art vehicle design: riders will be seated at the end of a large four-degree-of-freedom robotic arm attached to a roller coaster chassis. Wanda Group posted a picture of the successful prototype testing that occurred in the United States. They stated that the multi-dimensional cinema concept combines “dark ride equipment with the roller coaster experience” unlike any attraction in the world, putting to rest speculation by coaster enthusiasts and industry insiders about the details of the ground-breaking attraction. The project breaks through the traditional experience of dark rides and roller coasters, allowing visitors of Wanda Guangzhou City to feel the unlimited potential of movement and total immersion in the storyline. Guangzhou Wanda Cultural Tourism City is a 50 billion yuan investment project located in the city’s Huadu District. It covers 154 hectares and has a gross floor area of 3.8 million square meters. It will include a Wanda Mall, outdoor theme park, stage show, numerous hotels. A bar street and more. The Wanda Movie Park will be a state-of-the-art entertainment project. The multi-dimensional theater, “The Ghouls” is the first ride to combine a mobile platform with multiple degrees of mobility to a robot arm and a roller coaster. Dalian Wanda Group was founded in 1988 and is engaged in three key business activities – commercial properties, culture, and finance. Wanda Commercial Properties is the world’s largest real estate enterprise and the biggest five-star hotel owner in the world. 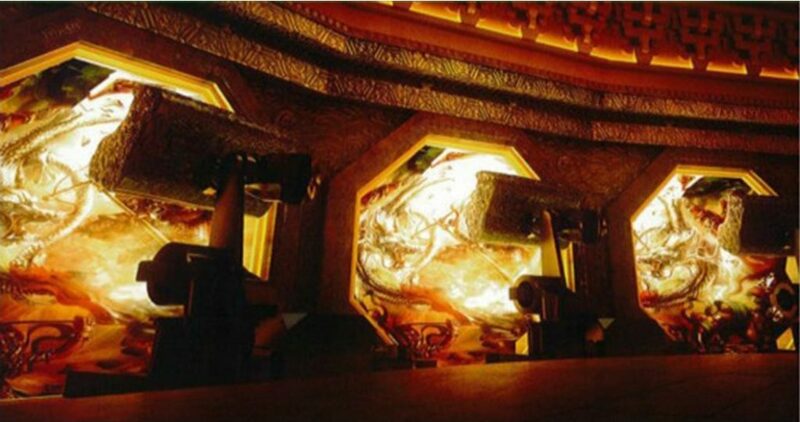 Wanda Cultural Industry Group is the largest cultural enterprise in China, and the world’s largest cinema operator. It owns four companies- film holdings, sports holdings, tourism holdings and children’s entertainment. The Wanda Financial Group is the largest internet finance enterprise in China. By 2020, Wanda Group aims to become a world class multinational corporation with assets of $200 billion, market capitalization of $200 billion, revenue of $100 billion and net profits of $10 billion. For more information, please visit www.wanda-group.com.